Are you constantly on the lookout for the best deal? Do you aimlessly search the web to find the best freebies? If you answer yes to either or both of the previous questions, then iSlick might be the app for you. 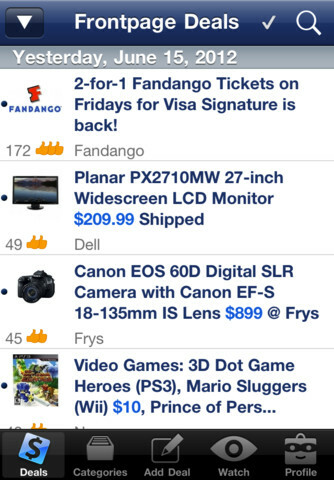 The app contains comprehensive lists of deals accumulated from all over the internet. iSlick’s deal section features lists of front page deals, hot deals, freebies, coupons, contests, your personal favorites, top rated, and top favorites that update continually. 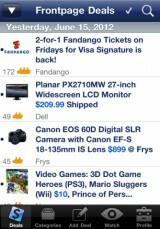 You also have the option of searching through deals by category as well. Clicking on any deal will bring you to a full description of the product, the choice to give it a thumbs up or down, the ability to star the item as a favorite, and the option to share the deal through email, SMS, Facebook, or Twitter. The app also contains a forumfor every single item listed in their app where users can go and leave comments about the deal. I found this to be an absolutely amazing feature, because customer feedback is usual more helpful that customer service. iSlick also allows users to add any deals they find to the app, which is a good way to get customers involved in the process. What also impressed me about iSlick is that it allows you to create custom alerts for any consumer category that will alert you (with a push notification) when a deal pops up. I find that many apps in this genre are cluttered and not designed well, because the developer has to pack in so much information into their app. I believe iSlick did a decent job with the user interface and pulled off what could be a powerful deal app for any user.